What's Alan Watching? : Community, "Comparative Religion": Merry happy! Speaking as someone who was motivated to do more than just community college, I still ended up there for three years, so. I didn't realize that was Anthony Michael Hall until reading the post. Wow. I really liked this episode and thought it had the most laughs of the NBC line up (although surprisingly The League was for me, the funniest show of the night). Britta's continued assertion that fighting was just an outlet for repressed "gayness" was a funny running joke capped with the final "Come on, am I being punked?" when the gang took their shirts off. The Brawl at the end was hyterical and I actually watched it twice. Good call on Anthony Michael Hall being the original Rusty Griswald- I had forgotten about that and I agree they definitely should have done more with that. Speaking of small linguistic points, Alan: I had hoped you would be one of those maintaining the standard of "more so" being two words. While not my favorite episode of Community story-wise, I will say this is the one I laughed outloud the most during. From the Dean knocking himself out to Abed (and then Jeff) decorating Troy, I found this to be their funniest outing. I was oddly bothered that Britta didn’t bring anything to the party; everyone else brought something so it just made her look really rude. This episode was the first time I've had a chance to watch this show, and I enjoyed it. But one thing that kept bothering me about it - the characters' mouths didn't move in sync with the audio, as if the production team did a very poor job with looping/dubbing (if indeed they do looping). Is this a common occurence on this show? chevy chase bringing it hard. @Stacy- I think the writers had her not bring anything to set up the joke about atheists not believing in anything. @Rinaldo- that struck me as odd to, my best guess is that it had to do with tone that they were saying Jew as opposed to Jewish. I didn't know it was Hall either. Wow. Funny how each person had a different religion. I am an agnostic and appreciated the comment that it is a lazy atheist. I have heard that one before. No love for Troy in this episode? The Jehovah's Witness line about blood transfusions, his Shamalamadingdong, and his "Fiiiiiiiiiiiiiiiiiiggggggggggghhhhhhhhhhhhhhhhhhhttttt" were the best lines of the night. Jeff comparing organized religion to Paul Rudd was also a great line. I loved the running fighting is gay joke, boxers fight for a purse and a belt. My favorite. Though I imagine others thought it was worth it, I thought it undercut Britta's running joke about fighting being gay to have a group fight in which Britta is fighting. Still, the best comedic use of Gillian Jacobs since the Halloween episode. Until Valentine's Day, Britta. While I'm on the subject, I have overlooked it mostly because Alison Brie always sells the moment, but it's really been bugging me lately how inconsistent Annie's character is. "I'm so sick of the dean shoving his pc-ness down my throat"
Thank goodness for you, Rinaldo -- I was thinking I was being a nitpicky jerk about the "moreso" problem. Alan is such a good writer that something like that really jumps out. It just isn't one word. And the Jew thing confused me too. Not the funniest episode, but a few laugh-out-loud moments. My favourite NBC comedy of the night. Troy was pretty funny with the harmonising in the tag and fiiiiigggghhhhttttt. Britta stood out with all her fighting=gay jokes and boy did that fight prove her right, it looked like Chuck Lidell experiencing interpretive dance. I think Alison Brie should be nominated for an Emmy, she's just been really, surprisingly good as a comic actress and although I think Jane Lynch already has it in the bad she should at least be recognized for some great work. All the inoffensive Politically correct was pretty bi-larious (Merry Happy etc. ), and the Dean always has some the best lines but at times it just seemed like they were obviously hating on (that's a thing, right?) Shirley for being overly christian and sweetly oblivious to Greendale's multiculturalism. The reappearance of "The Greendale Human Being" was frightening too. Seriously, is there a more disturbing mascot out there? If you're reading this Alan/fellow commenters, what show is more meta these days: Community or 30 Rock? I thought last night's episode was wonderful. Favorite moments that haven't been mentioned by anyone else: (1) Troy and Annie's failure to recognize who Billy Joel was; (2) the bike rack discussion between Jeff and Anthony Michael Hall; (3) pretty much everything Troy did in the episode (seriously, he's swiftly becoming my favorite comedy character on TV). Alan said: "Setting this episode at Christmas, and at the end of their first semester, puts to rest any idea that the show might try to get around the whole two-year problem of community college by having each season cover a semester. I like this show and would like it to be around a while, so I'll be curious to see how they deal with this down the road, particularly for characters like Annie and Jeff who are motivated to do more than just hang around at Greendale." Thank you for saying that Alan. I made similar comments on here a couple of weeks and was attacked (relatively speaking) for wondering such things. 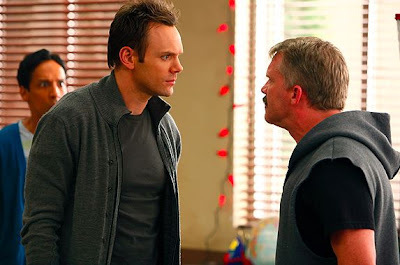 I always assume they would find a way to keep Joel NcHale around, but Annie and perhaps Troy or Abed (all the true youngins), not so much. Overall, funny episode, continue to enjoy. You realize that the show's first season isn't over, right? In your post, you comment that the show is doing one semester per season of Community. However, they are moving to the second semester in the next episode (which will still be the first season of the show). Chevy (I'm paraphrasing): What are you, a Korean seamstress? Joel: Not if that's bad. Hopefully the show makes it to three seasons in the first place so we can deal with the graduation problem. A possible solution would be to have Jeff and Britta stick around at professors. I thought Annie looked amazingly hot spraying a guy with fake snow. And I completely missed the Chevy Chase-Anthony Michael Hall connection. But can anyone steal a scene like Senor Chang? Loved the snowboarding gear. I am aware, yes. Thank you very much. My point is that the show could have pulled a St. Elsewhere and turned each half-year period into an entire season, which St. Elsewhere made clear by putting the Christmas episodes at the end of its odd-numbered seasons. By putting the Christmas show here, midway through year one, it's clear that Community is following something vaguely resembling real time. Which means that sooner or later, the two-year issue - and, more importantly for Jeff's purposes, the Associate's Degree issue - will need to be dealt with. That would make even less sense. I agree with everyone mentioning their favorite moment as Troy trying to stretch fight into another word. I actually had to pause the show to recover. I'm fairly certain that it was established in the pilot episode that Jeff was going to need a 4 year degree. So, effectively the show could go on for 4 years minimum with the main character onboard. Plus, it wouldn't be too difficult to have him fail a semester or 2 just to extend the show out another year or so. Most community colleges now offer 4 year degree programs through an arrangement with local Universities anyway, so I'm not sure what all the concern is for the length of the seasons. If we can believe that the Greendale has a dorm, than I think it is safe to assume that they offer Bachelor's Degrees as well. On a final note, is it really going to be all that hard to convince an audience that this group of people, who have been making bad decisions all of their life, are actually going to get out of community college in 2 years? I wouldn't think so. The Forrest Whitaker Eyes line and the Christmas Troy bit (with a nice bit of meta humor from Jeff there) had me rolling in this ep. I might be remembering this wrong, but I thought in one of the early episodes they established that Greendale offered four year bachelor's degrees. It bugged me at the time because that's not what community college is. It could be I misinterpreted a comment about Jeff needing a bachelor's degree and assumed they were saying he would complete it at Greendale. Troy has consistently been my least favorite character but last night he brought it. I had to keep rewinding because I'd miss a new joke while still laughing at a previous one I join the group who loved Troy stretching out "fight". I didn't mean to come off crappy, but it seemed like in your original post you were proclaiming the show was going to do one semester per season, and references this ep as where you realized it. So I wanted to clear it up. Side note: Did you get my email about another sight plagerising you? The Forest Whitaker eye was great not only because it looked hilarious (and Jeff's terrible version may have made me laugh more than Troy's), but also for the moment when Troy turned around to argue with Britta and he was still doing it at first. This show is so on when it comes to little things like that. Also, Mike's plan to go to Applebee's if Jeff didn't show up because he was "definitely getting in a fight today" killed me. This is my favorite comedy in a very long time. I like 30 Rock and Parks and Recreation and Modern Family, but this one has the highest batting average, wekk after week. Probably because, when it comes to movies, I'm like the slightly less socially awkward version of Abed. I am their humor's target demo to a T.
I loved Annie's whole scene with Prof. Chang. Also, thanks for the note on the music. this might be too obvious too mention, but I thought the fingerless gloves and the cut off sleeves were a hat tip to judd nelson's character from the breakfast club. Troy's "Forest Whitaker Eye" on Community had to be one of the funniest gags I've seen in a long time. And it was funny that Anthony Michael Hall essentially went from being nerdy Brian to bully-like Bender in the episode. Ironic given that I just watched The Breakfast Club a couple of days ago. I think I like Annie even more now that she's Jewish. And as for using the whole word or not, it really can be in the way it's said. I completely understood why Annie would want both of those characters to use the whole word. This is now my favorite holiday episode of any show, ever. Shirley was a little deranged in this one (I think that's why Annie was insisting on the full word, Shirley was coming off derogatory), but it did make for some funny anyway. Did not recognize AMH at ALL. Holy cow. This was just a hilarious episode, for all of the reasons mentioned already---I thought it was the funniest episode so far. The "Forest Whitaker" line was my favorite but there were a dozen great lines. I don't know how they'll explain everyone being in community college for many years, but right now I just want them to get renewed for a second season. We'll worry about the rest if that day ever comes. Hmm, if Troy can't drink as a JW, what about that keg stand? It was a keg flip. Also, Jennifer, his line was something like, "I'm a Jehovah's Witness, so I can't drink...but it helps." Wow, that was Anthony Michael Hall? Wow. That's awesome. Those 'fighting faces' after the 'Sups' probably shouldn't have cracked me up as much they did, but there you go. For the same reason I floss, have a bed frame, and keep my guitar in its case. I'm over 23. Yeah, I was waiting for a Vacation reference the entire episode. Oh well. "Moreso" is an accepted American variant. If it's good enough for Ben Zimmer (yes, I do in fact have a favorite lexicographer) and the OED, it's good enough for me. I find that Community usually rewards multiple viewings, and I love the stuff I pick up the second time. This week, it was Troy silently asking Annie who Billy Joel was (and Annie mouthing back that she didn't know!). Also the Greendale Human Being continues to delight and terrify me, and seeing him/her/it made up as a reindeer will surely haunt my dreams. On a side note, did St. Elsewhere really only do three Christmas episodes during their six year run? My (admittedly hazy) memory seems to remember more. I thought they just kind of fudged a little bit on that particular detail. "If it's good enough for Ben Zimmer (yes, I do in fact have a favorite lexicographer) and the OED, it's good enough for me." R. A. Porter, I find you truly crushworthy. I didn't catch Shirley saying "Ooohh.. hashbrowns and applesauce!" when Annie brought in latkes until the second viewing and I'm glad I wasn't drinking something, I would have done a spit take. And her sad-faced "Why do you hate me and Jesus" killed me both times. Ditto on hilarious, the Forrest Whittaker reference . I could keep going...ditto to all the above quotes. A show of small comic gems - most shows would be doing good to have that many in a year. One more that was funny and sweet - Shirley singing the PC-ish, tolerant carol at the end. It was strangely touching , for me. This episode was a lot of fun an one of my favorites for the season. Annie is now giving Erin from the Office a run for her money on the scale of cuteness. As of this episode she has a officially reached the rank of Widdle Bitty Kitten. So, what exactly IS the "whole word"? I thought "Jew" was the whole word. Is there a longer version? It was also a great line to read. In the better-late-than-never department: I finally got around to seeing this one. I DVR'd it, but I confess, what I saw here about the Jew/Jewish thing made me hesitate to watch it. I am Jewish. I am a Jew. Most of the Jews I know will tell you that there is nothing wrong with the word "Jew" if it is used properly (as a noun not an adjective, e.g., not "Jew student"), and is certainly preferred to the awkward substitute "Jewish person." In fact, I once saw a comment that it is offensive to say that "Jewish" is better than "Jew": is "Jewish" less Jew? Like "pinkish" is less pink? And is less Jew better? That said, there does seem to be some preference for the word "Jewish" over "a Jew" in contexts where they are interchangeable (She is Jewish / She is a Jew). And the word "Jew" does tend to be used more by antisemites than by Jews, which is why the #1 hit for the word "Jew" on Google is frequently an antisemitic site. All that said... Annie's "use the whole word" line didn't sound very authentic to me, but most of my Jewish friends are more serious about their Jewishness than Annie probably is. There are plenty of Jews out there who have some very strange ideas about what it means to be Jewish, and perhaps some of those Jews would think that "Jewish person" is preferable to "Jew." Whether it is offensive to me, or to most Jews, is irrelevant; Annie made her feelings clear, and the rest of the study group should respect that. On the other hand, Annie's reaction to the "WWBJD" bracelet ... ah, the joy of being Jewish and receiving Christmas-specific gifts from people you don't want to offend... Annie looked like a cat had just given her the gift of a dead mouse.